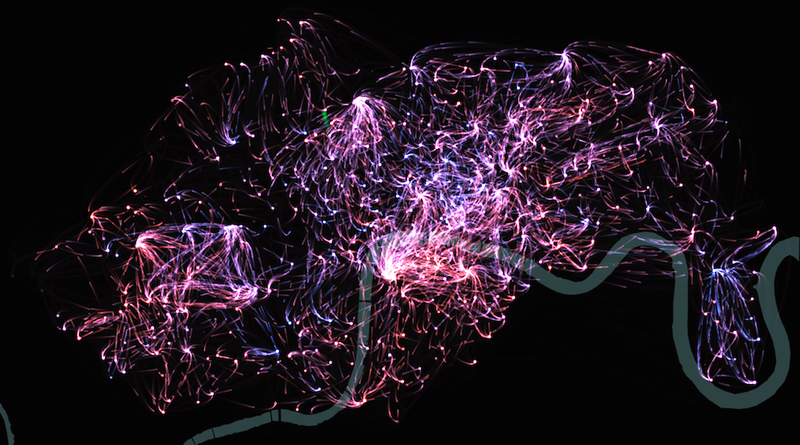 Data from over 20 million journeys made with the London Cycle Hire Scheme ("Boris Bikes") are used to feed an animation of our bicycle movements across London. Our journeys are captured and rendered as smoothly flowing curves through the capital. The apparent chaos of so many journeys gradually clears as structures emerge that reflect our reasons to travel. Leisure cyclists exercise their way around the royal parks; commuters hurry to and from railway stations; weekenders embark on cultural excursions of museums and galleries. Layered within this palimpsest of journeys a single bicycle is ridden across London. Known only as "Bike 12248" it is pedalled hundreds of miles from the East End to the South Bank; from Westfield Shepherd's Bush to Westfield Stratford. It is a shared effort - hundreds of riders each take their turn to move the bike onward. As they do so, a signature is written across London, tracing a unique path never before taken in the 2000-year history of the city. We make this art through our urban dynamism. 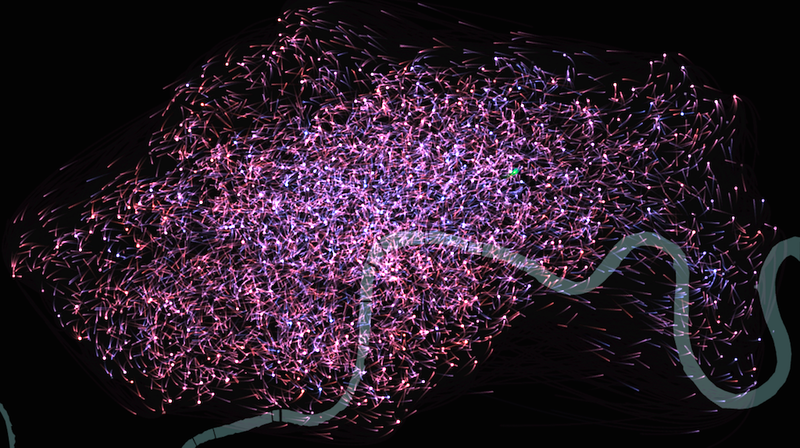 The animation evolves in response to where and when bicycle journeys are made. Linked to real-time open data provided by Transport for London, praeternatural hotspots emerge as cycle docking stations become busier and then cool as we leave them to continue our travels. We shape this art though our interaction with it. Using in-room motion detection, the more observers who participate in this kinematic data sculpture, the richer its form. By reaching out with our arms, the tails of each journey elongate with us. We see not just where we are heading, but where we have been. Intertwined with this filigree, bike 12248 leaves a lone green trace as another leg of its journey is completed; its signature becoming ever more elaborate. Shown as part of the Digital Shoreditch 2013 Great Digitial Exhibition this interactive exhibit can be found in Room B10 and in July 2013, at the Museum of London.